My hair lately, has been really dry and brittle mostly because of the change in weather. It uses to be the complete opposite but we all have bad times. I go through the procedure of losing hair and getting an immense amout of split ends which really makes my hair appear....well not really nice I guess haha. So I have been on a mission to put a stop to this. 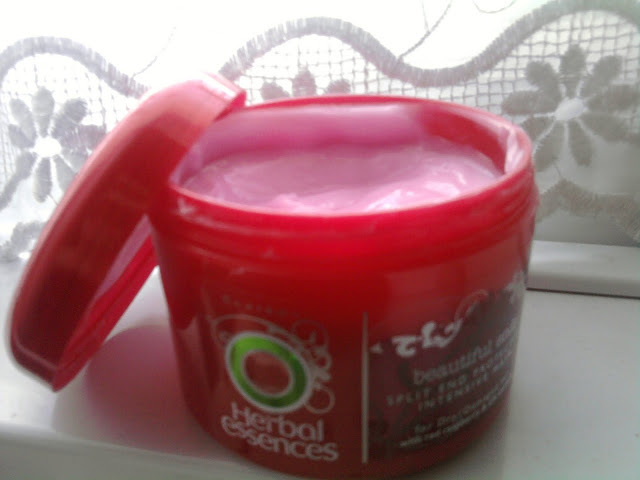 I have been looking for some sort of a hair mask or hair conditioning treatment for dry damaged hair. Well firstly I completely stopped using heat on my hair and just let it be natural which of course helped. I recently went to Superdrug to buy shampoos etc and I found the Herbal Essences 'beautiful ends split end protection intensive mask'. 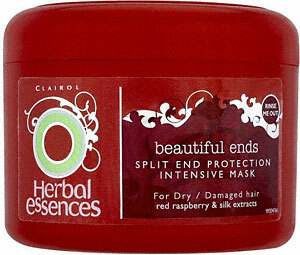 The one I have is for dry and damaged hair with red raspberry and silk extracts. 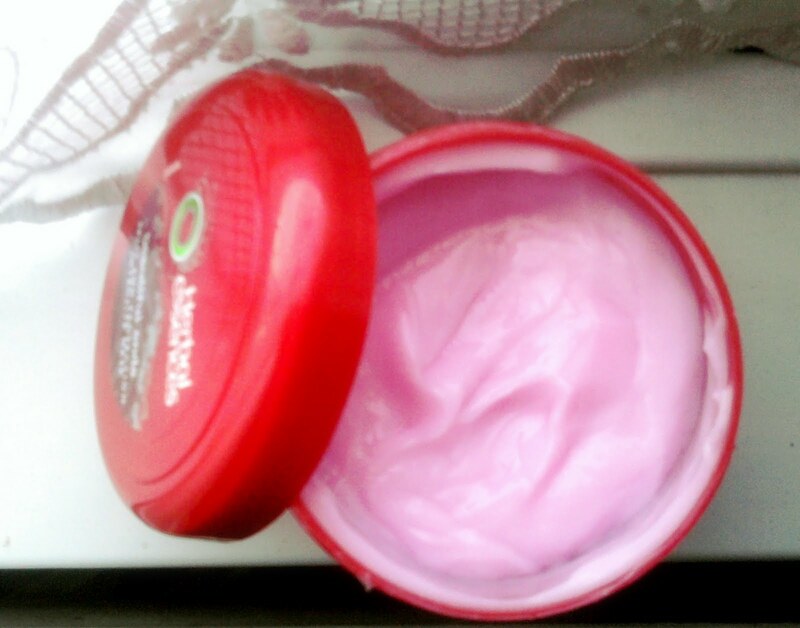 Firstly, packaging wise its a red tub like many other masks or similar products. I am never fussy in packing unless its all falling out. The quantity given is 200ml. So it gives you instructions on how to use and also how often you should use this. The product has a really delicious smell and leaves your hair smelling like that for hours. Its really fruity and the texture of it is very smooth, creamy and silk like. The cream itself is a shade of light pink. So I was literally examining every move of this product while washing my hair haha. My hair is really thick. I call it fat at times. So to me it really depends what your hair is like ( thin, thick, fine) for how much you are suppose to use. I think I used my 'two finger spatula' for my hair. Just massage it in your roots and tips just like the given instructions. I will say that it took me a little while to rinse it out thoroughly. While my hair air dried, it was way way softer, smoother and silkier than an hour ago. For me the split ends were less visible and the tips of my hair were a lot softer. my hair wasn't feeling like crap and after months of hating my hair I actually loves it. I would give it an 8 and half out of ten. I got mine from Superdrug for £1.95 as it was on half price I think. The original price is from £3.99 to about £4.00. I would say that its really good value for that much money... bargain! Better grab another one. I've used this about 3 times now. I wanted to use this a couple of times as the first ever time you uses any product it does wonders but I wanted to see if this continued and it did. Love it. great review, ive been looking for things to nourish my tired dry hair. Ive recently tried the sulfate free LOreal replenishing masque (a review on my blog) however I was quite disappointed from the results. Thankyou so much for the review. A while ago I purchased the normal conditioner version of this but it didn't really work, so it's great to know that this mask does as I really need something for my split ends. What shampoo, conditioner do you use it with? I am a new follower of your blog and look forward to more posts and reviews!